I used some googly eyes I think that's what you call them in matching colors for my people. The patterned paper is from Creative Memories it is an old line but I love the fun colors and designs on the paper so I decided it was perfect for this card. Oh this is fabulously FUN! 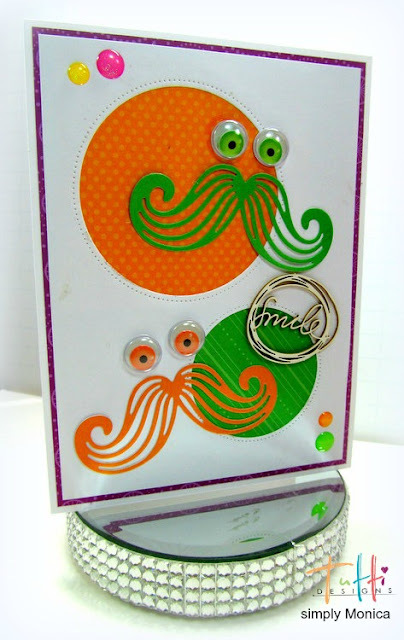 Love the colors and how you made the 'stache people' so creative and CUTE!!! I have never seen googly eyes like those! I checked and you dont carry them-can you tell me where to find them? Waverunner it has been so long ago when I go these I can't remember where I got them.